CRAZY DISCOUNT! Was: $419.95 Now: $269.96! The New PROFLEX SPN700 Spin Bike is the perfect way to get commercial grade fitness equipment into your home. This state-of-the-art unit has been designed to include the best quality features for spin cycling. While other spin bikes used in home gyms typically feature a low-grade flywheel, PROFLEX have incorporated a heavy stainless steel commercial flywheel. This is beneficial because it creates a smoother, more realistic sensation of riding compared to inferior alternatives. Comfort is essential to get the prolonged use out of fitness equipment that will see you reach your goals. For this reason, PROFLEX has prioritised ergonomics and comfort as core attributes for the SPN700. The seat, seatpost and handlebar are all adjustable to suit a range of users. It features an extra-thick padded seat and secure gripped pedals with toe straps that provide an authentic feel and fluid pedal motion. Even its belt drive system acts to replicate the natural sensation of an on-road bicycle. 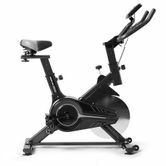 All these inputs work in harmony to provide a best-of-breed spin bike that can be used all year long in any room of the house, meaning fitness goals can actually be reached, and then exceeded. Cycling is an extremely beneficial style of working out. Along with weight loss, cycling increases cardiovascular fitness, muscle strength and flexibility; improves joint mobility, posture and coordination; reduces negative mood disorders; and helps prevent or manage disease.